I recently made this little tool as a favour for someone that wanted a simple alternative to giving first line support technicians access to the full AD Users & Computers MMC tool when all they needed to do was reset passwords or unlock accounts. I figured others might find it useful so its now available to download from my website. Please note that this tool does not bypass any of the permissions required in AD to unlock accounts or reset passwords – you’ll still need to delegate those permissions to your helpdesk technicians in AD. This tool just makes it easier for them to then actually do the unlocking/resetting as they don’t need to go through the full AD Users & Computers console, all they need to do with this tool is enter the username they want to work with, tick the relevant options for unlocking or resetting passwords, click a button and that’s it. Job done. Its a free download and although its obviously very simple and not anything ground breaking hopefully it at least helps a few people out that wanted lower level admins to be able to reset passwords etc without needing to know anything about how to use AD Users & Computers. Works like a charm. I am working on something similar to this as a part of a server management application that does numerous tasks performed by support technicians. Would you be willing to provide some sample code to exemplify how you go about calling on AD, as you have with some of your other tools? Send me an email (my contact details are here: http://www.cjwdev.co.uk/Contact.html ) and I’ll send you some relevant parts of the code. For this particular app there wasn’t actually much code for me to write as I was able to use the System.DirectoryServices.AccountManagement classes (some examples here) which make things very simple and easy to do. I can’t usually use these classes in my other more complex programs as they don’t offer the same level of performance and flexibility as the slightly lower level System.DirectoryServices classes. I did run as administrator. Thx, we need that tool for the help desk, but it would be much better if it allowed search and showed the full name. Thanks for this too ! I used it since few week. Is it possible to make the search in a specific organization unit and not all AD ? Hi. I sent an email but not sure if it went through. 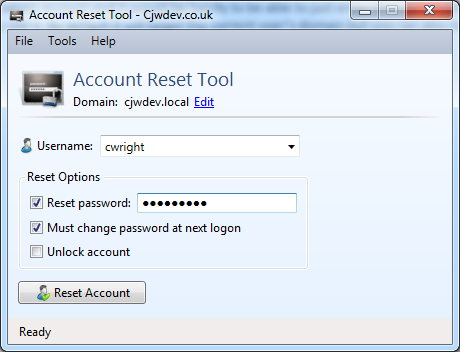 Love the simplicity of the Account reset tool. Was wondering if there was any chance to enhance it with the following. 1) A status field that tells us if the id you are looking up is disabled and or Locked out so you know you really need to unlock it. 2) A disable/enable option for ids. 3) Maybe a AD lookup tool field so you could find the userid of a person. So by Looking up “Grant Wilcockson” it will come back with my id ngwnf, then I could reset that. I dont know everyones login id but do know their name. I know I am asking a lot but this would really turn this into a all in one tool for my areas helpdesk team.